Planning to get your home renovated? Knowing the basics of the scope of work for home renovation is essential so you will have a general idea on the things you can expect, the guidelines you need to follow, the schedule of work, the terms and conditions, and many other things. In order to help you overcome common challenges regarding home renovation, this article will provide you with a discussion on how to create a scope of work for home renovation as well as related templates and examples. It is important that you first brainstorm the pieces of your home renovation so you will get a better idea of the choices you will need to make later on. It must provide the details of the negotiations of the contract, the work to be done, the people responsible for completing the work, how the work must be performed, and what materials will be used. 2. Write your scope of work in the early stage. Writing the scope of work in the early phase of the renovation when the project is still taking shape will help you define, refine, and develop the project. Have a proper planning on the different aspects of your work, such as team structure, existing building composition, air handling zoning, cleanliness and environmental needs, containment requirement and strategies, and energy-saving strategies. 3. Organize the scope into several components. The components of a scope of work are as follows: project overview, which provides a short summary of the project description; project deliverables, which present information that will help a contractor understand the project’s requirements; project scope including the budget and technical data, which includes technical considerations and specific tasks needed to satisfy the objectives of the project; project schedule, which summarizes all the tasks related to the project and specifies the delivery date, duration of the project, and time restrictions; and lastly, project management, which describes the primary functions of the project administration, including contract terms and legal requirements, project limitations, and time management. 4. Define success and failure. Clearly define what constitutes a successful or unsuccessful project and include criteria or guidelines so you will know what end product is considered acceptable. For example, in painting the ceiling, the acceptable criteria might be painting them with colors yellow and black, and the unacceptable criteria might be using green and pink. 5. Assign work to appropriate personnel. Finally, it is important to clearly define the roles of all the members of your team so you will maximize everyone’s potential in your project. A home remodeling and renovation proposal will help you get started with your home renovation. Provide your clients with an organized and structured proposal using this template for a guaranteed project deal. 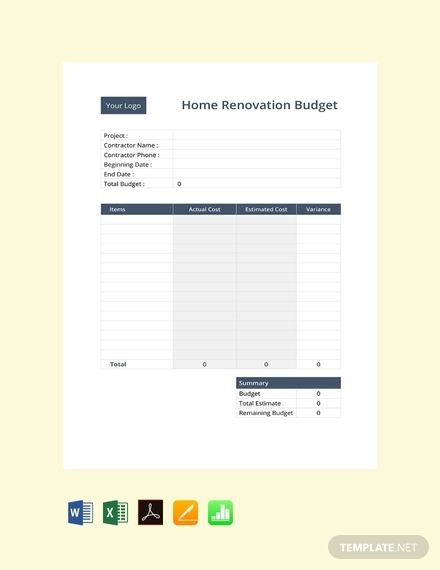 Organize and keep track of your budget for your home renovation using this effective home renovation budget form. With a well-prepared budget, an increased possibility of a successful home renovation is an assurance. 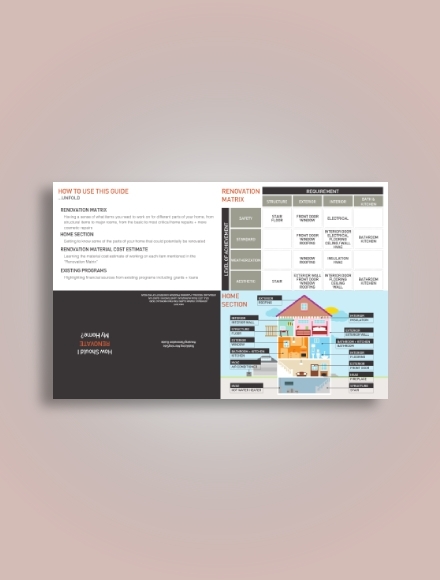 Know what items you need to work on for the different parts of your home from the basic to the most critical home repairs through this home renovation matrix. Through this, you can also determine the parts of your home that can be potentially renovated, the renovation material cost estimate, as well as the financial resources from existing programs, including grants and loans. 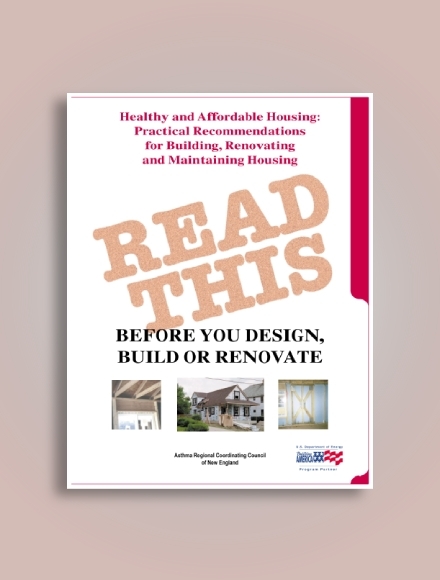 Before you renovate your house, this document is something that you must read. It contains recommendations regarding the water system, air system, combustion, dust entry control, keeping out unwanted creatures. 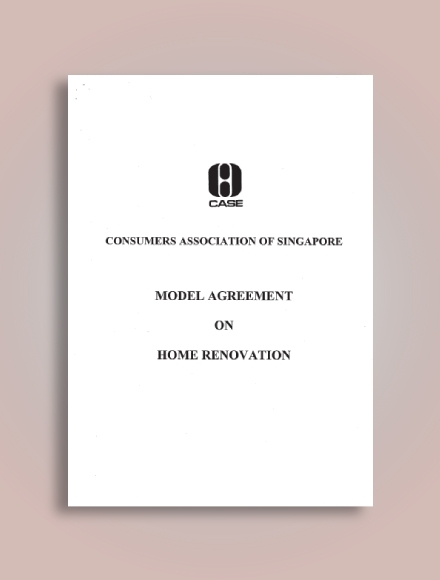 Start right with your project through this model agreement on home renovation. You must have a clear and specific terms and conditions in your agreement to avoid future conflicts regarding your project. 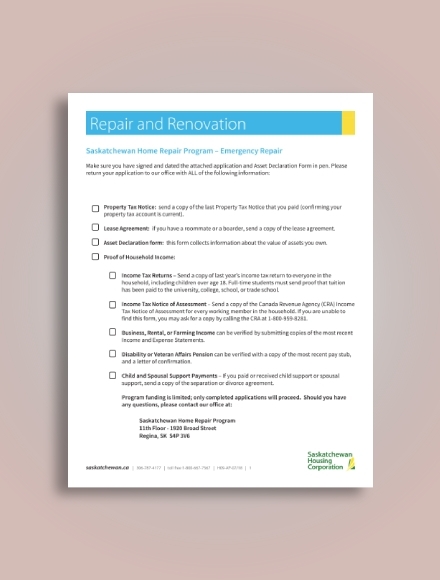 Secure a home repair and renovation form in order to keep your agreement with your contractor safe. Put every important detail regarding your home renovation into paper through this detailed renovation form. 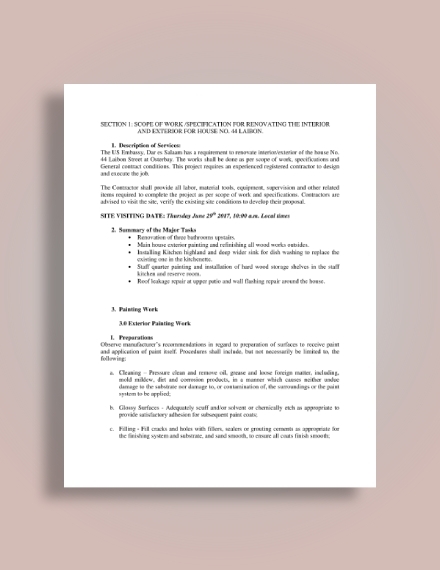 Keep a detailed description of the services for your home renovation by referring to this home renovation document. This includes specifications for renovating the interior and exterior of a house and summary of the major tasks from preparation to application. Are you working on a home renovation or repair project? 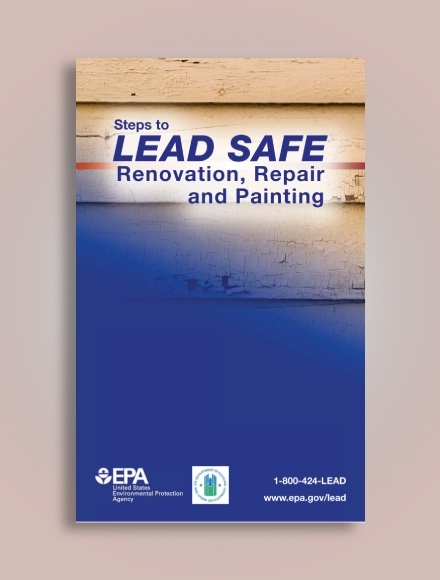 This guide will help you complete a home renovation or repair using lead-safe work practices and how to work safely with lead-based paint. This is helpful so you can set up the job safely, leave the work area clean, and minimize the creation of dangerous lead dust. 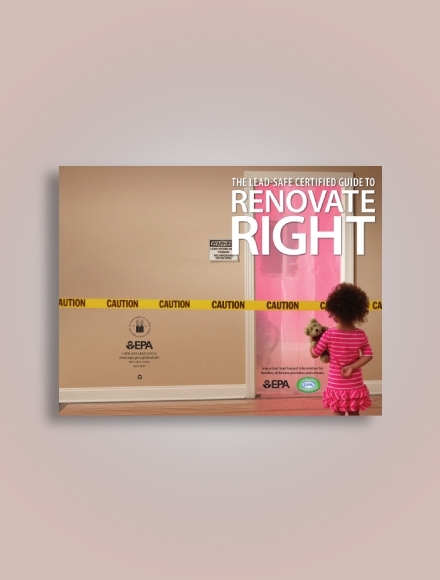 Learn not only about home renovation basics but also about facts about lead and your health, how to choose a contractor, how to prepare for the renovation project, what to expect after the project, and a lot more through this simplified guide to home renovation. 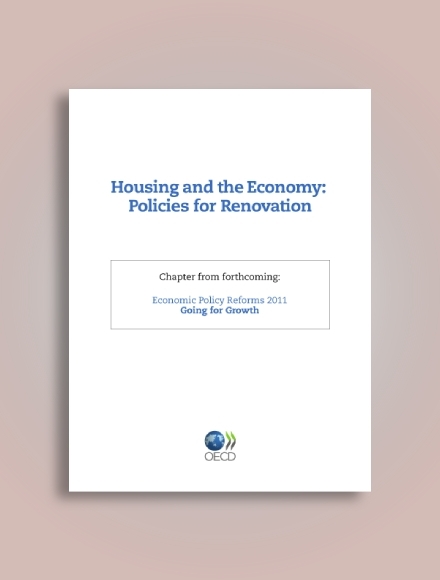 Know the different policies for home renovation in different countries through this document. Also included are recommendations for efficient and equitable housing policies that can contribute to macroeconomic stability and growth. The scope of work for home renovation can be so broad, but hopefully, you have learned something from this discussion. 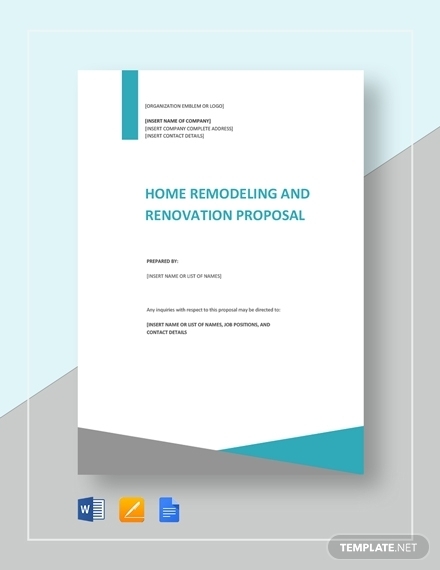 Never hesitate to take a step in creating a scope of work for home renovation, and do not forget to download the appropriate template of the scope of work for home renovation presented in the sections above.